Tracking the Light Special: Irish Rail 071 in Heritage Paint—Now. At 1007 (10:07 am) this morning (8 February 2018), Irish Rail’s 071 (class leader of the popular 071 class of General Motors-built diesel locomotives) passed Islandbridge Junction with the down IWT Liner. Exposed using my FujiFilm XT1with 90mm Fujinon lens. It’s a bit misty in Dublin. Image scaled from in-camera Jpeg without post processing contrast or exposure adjustment. This locomotive was repainted in 2016 into the attractive 1970s-era livery. Although, I’ve made a number of photographs of this locomotive in heritage paint before, it’s always nice to see it on the move. I’m told it had been laid up for the last few months and it’s only back on the road this week. TRACKING The LIGHT EXTRA: RPSI Steam Special to Drogheda and Dundalk. Today, Sunday 9 August 2015, the Railway Preservation Society of Ireland in cooperation with Irish Rail operated a steam special from Dublin’s Connolly Station to Drogheda and Dundalk with locomotive number 4. Exposed with a FujiFilm X-T1; RAW File exported as a Jpg using Adobe Lightroom. This was my first opportunity to photograph this classic locomotive in more than four years. Special thanks to everyone at the RPSI and Irish Rail who made today’s trips a success. Stay tuned for more photos tomorrow! Irish Rail 201s at Ballybrophy—a study in colour and light. It was a typical late summer’s day at the top of Ballybrophy Bank on Irish Rail’s Dublin-Cork mainline in 2006. I was expecting a procession of passenger trains down road (toward Cork). At the time there was still a good variety of intercity passenger stock and Irish Rail’s 201s were working in four different liveries. This was an opportunity to show the passage of trains. Here, I’ve presented variation on a theme. I’d mounted my Nikon F3 with 105mm lens on Manfrotto 190PRO tripod. I kept the essential framing the same for each passing train, while making necessary changes to exposure reflecting the changes in light. Frame 1: Irish Rail 220 with Cravens. Exposed on Sensia 100 with a Nikon F3 with 105mm lens. Exposure calculated with a Minolta Mark IV light meter. Image scanned with an Epson V500, other than scaling for internet presentation, I’ve made no modifications to colour, contrast or exposure. Frame 3, Enterprise painted 206 leads Mark 3s. Exposed on Sensia 100 with a Nikon F3 with 105mm lens. Exposure calculated with a Minolta Mark IV light meter. Image scanned with an Epson V500, other than scaling for internet presentation, I’ve made no modifications to colour, contrast or exposure. Frame 5, Irish Rail 211 leads Mark 3s. Exposed on Sensia 100 with a Nikon F3 with 105mm lens. Exposure calculated with a Minolta Mark IV light meter. Image scanned with an Epson V500, other than scaling for internet presentation, I’ve made no modifications to colour, contrast or exposure. Frame 6, Irish Rail 216 leads Mark 3s. Exposed on Sensia 100 with a Nikon F3 with 105mm lens. Exposure calculated with a Minolta Mark IV light meter. Image scanned with an Epson V500, other than scaling for internet presentation, I’ve made no modifications to colour, contrast or exposure. Notice how the quality of light and the position of the train changes the scene. Normally when photographing moving trains, I’d adjust my framing, angle and the focal length of the lens to reflect changes in lighting, length of train, and the colour/shape of the leading engine as it specifically relates to background and foreground elements. The effects of sunlight and contrast make a significant difference in the end result. Heeding a prophecy of doom: Irish Rail 129 at Wellingtonbridge, Co. Wexford. December 23, 2002 was a cold, wet, dark and mucky; in other words, typical sugar beet weather. We were visiting the cabin at Wellingtonbridge, watching the machine load beet into ancient-looking four-wheel corrugated wagons. A steady ‘thump, thump, thump’ as the roots plopped into the wagons. Sadly, his prophecy came true. Old 129, a class 121 diesel built by General Motors at La Grange, Illinois in 1961, was cut up for scrap only a few months after I exposed this black & white photograph. Exposed on black & white film with a Rolleiflex Model T.
Irish Rail’s sugar beet traffic carried on for a few more years (three more than I thought it would). The last laden beet train departed Wellingtonbridge in January 2006. Afterwards, it was a downward spiral. Today, the wagons and loading machine are gone; the cabin is closed and the line rusty. Yet, in the intervening months and years, I returned dozens of times, and made photos at all times of day and night. By the time the last beet train turned a wheel, I’d made hundreds of images of operation. Connolly Station in Green Light. Yesterday, I displayed an image of Dublin’s Heuston Station bathed in green light; today, I feature Connolly Station. These Dublin railway terminals are among the oldest big city stations in continuous use in the world. Connolly Station features classic Italianate architecture typical of many large stations world-wide. Exposed on Talbot Street with a Lumix LX-7 mounted on a mini Gitzo tripod with ball head; ISO 80 f2.0 at 1/3.2 seconds with daylight white balance. Pity about the refuse sacks on the footpath. Exposed with a Lumix LX-7 mounted on a mini Gitzo tripod with ball head; ISO 80 f2.0 at 1 second, daylight white balance. This was made at 7pm on March 13, 2015. The greening of Connolly for St. Patrick’s Day is a more subtle treatment than on some of Dublin’s structures. An Irish Rail 29000-series DMU cross Talbot Street on the Loop Line Bridge. Lumix LX7 photo. Connolly Station is directly behind me. Among my favorite stations on the far flung Irish Rail network was Carrick-on-Suir, County Tipperary. The combination of a rural atmosphere with an interesting track layout and unusual curvature, high signal cabin (tower) with mechanical semaphores plus its reputation for friendly staff, made it an ideal place to spend an afternoon. I’ve probably made fifty or more trips to Carrick over the years. While, I often timed my visits to coincide with the arrival of freight trains, on this day I photographed the scheduled crossing (meeting) of 2700-series railcars working between Waterford and Limerick Junction. Exposed on Fujichrome Sensia 100 with a Canon EOS 3 with 50mm lens. This is a scene never to be repeated. The 2700s have been withdrawn and the passing loop (passing siding) at Carrick was lifted (torn up). Sometimes it is the most common everyday scenes that ultimately make for the rarest and most interesting photographs. Is there some everyday railway activity in your life that has gone undocumented? Brian Solomon will be presenting a illustrated talk to the Irish Railway Record Society in Dublin on Thursday February 12th at 7:30pm.This is titled Ireland in Colour, Bo-Bo’s, Rail Freight and Signal Cabins. England vs Korea: A 2-6-0 and a Diesel Multiple Unit—Face to Face. Exposed at Connolly Station, Dublin using a Lumix LX7. The other day, I spotted this photo opportunity at the car park at Dublin’s Connolly Station. Railway Preservation Society Ireland’s preserved 2-6-0 461 was parked face to face (or front to front, if you prefer) with one of Irish Rail’s common Intercity Railcars (ICRs). A perfect opportunity to photograph old and new together. Both are commonly seen on Irish railways, but both are foreigners. The 461 was 1923 product of Beyer Peacock in England, while the ICR was built by Rotem in Korea. Where else can you see such an eclectic combination? The steam locomotive was one of two built for the Dublin & Southeastern, and is one of only a few operating steam locomotives in Ireland. The ICR is Irish Rail’s standard type of train for intercity services. Do you think the ICR will still be around in 91 years? Illinois Railway Museum – The Largest! Looking west toward Duncormack, Wexford on the rusty South Wexford Line. A black & white print of a train climbing the grade here decorated my wall for years. Canon EOS 7D with 200mm lens. Today saw a rare movement on a line devoid of regular traffic. Railtours Ireland’s Emerald Isle Express train was operated as empty carriage across the length of the South Wexford line from Rosslare Strand to Waterford. Looking east toward the Robinstown Level Crossing. September 29, 2014, exposed with my Canon EOS 7D with 200mm lens. Railtours Ireland’s Emerald Isle Express is a high-end tour train making a week-long tour of Irish Rail. This position-move was the most direct means of getting the train from Wexford to Waterford and saved a lengthy deadhead via Dublin and Cherryville. It was operated by Irish Rail in conjunction with the Railway Preservation Society of Ireland. This was the first time I’ve photographed a train on the South Wexford in about six years. This line is storied ground: it was a favorite subject of mine a decade ago when a regular passenger service ran from Rosslare Harbour to Waterford using vintage General Motors diesels, and Cravens carriages like those that traveled the line today. It was also the route of seasonal sugar beet trains that loaded at Wellingtonbridge, County Wexford for processing at Mallow, County Cork. Between 1999 and 2005, I made more than 50 trips to photograph the sugar beet, a project that resulted in thousands of color slides, black & white negatives, and DAT audio recordings. I could make a book of it. Today, I traveled down from Dublin with Mark Healy to catch this unusual move. It was strange (and sad) to see this once-familiar line with rusty rails and heavy over growth along the right of way. While my best photos of the day were exposed on Fujichrome Provia 100F with my trusted Canon EOS 3, I’ve published a few of my digital results here. The Emerald Isle Express works west of Robinstown, County Wexford on September 29, 2014. Canon EOS 7D with 200mm lens. FInally after weeks, months, and years of disuse, a train comes to polish the rails. (I’m not counting the weedsprayer, inspection cars, or other perway moves, for the sake of sentiment.) The Emerald Isle Express works west of Robinstown, County Wexford toward Duncormick on September 29, 2014. Canon EOS 7D with 200mm lens. Rusty bullhead track at Ballycullane, County Wexford. The Emerald Isle Express passes Ballycullane, County Wexford on September 29, 2014. Regular schedule passenger service was withdrawn in 2010. The last sugarbeet train passed in early 2006—more than eight years ago. Canon EOS 7D with 100mm lens. Trailing view at Ballycullane, County Wexford. Lumix LX7 photo. MRSI Excursion at Ferrycarrig, County Wexford. I first visited Roscrea in August 1998. Denis McCabe was giving me a tour of rural Irish stations, and we stopped there to intercept the branch passenger train running from Ballybrophy to Limerick. Back then the train consisted of an 071 diesel, a steam heating van and two ancient looking Cravens carriages. It was a cloudy morning. Fast forward to August 2014, and Denis and I made a return visit to Roscrea. While I’ve visited this rural station on several occasions in the intervening years, what struck me was how little the station and its environs have changed. The old signal cabin is still open and active; the mechanical semaphores remain as I remember them, the station building seems unchanged. Compared to many of the station I visited in 1998, this is one of the few that still looks the same. The Celtic Tiger years didn’t result in unnecessary uglification—er, I mean improvement—to Roscrea. In 2004, Irish Rail replaced the traditional locomotive-hauled steam-heated Cravens with a more modern railcar. Today 2800-series railcars in the latest green and silver paint work the Nenagh Branch. Exposed with a Canon EOS-7D with 100mm lens. On the downside, you must know where the station is in the village. I don’t think there was any sign off the Motorway or in the town itself giving any hint of an active railway station there. It’s a real pity too. The Nenagh Branch is one of those throwbacks to another age. Unsung, unloved, and largely ignored, it soldiers on in a world that time forgot. Tomorrow: Old Budd Cars Never Rust. Special Post: Thursday September 18, 2014: Irish Rail 215 works Mark4 set. Last week I posted photos of freshly painted Irish Rail class 201 number 215 working the IWT liner. Today, it worked to Cork and back. I photographed it a little while ago passing Islandbridge Junction. Irish Rail 215 works at the back of a Mark4 set from Cork. I panned this using my Canon EOS 7D with 40mm pancake lens at 1/40th of a second at f10, ISO 100. 12:45pm on September 18, 2014. Irish Rail 215 works at the back of a Mark4 set from Cork, seen approaching Heuston Station in Dublin at 12:45pm on September 18, 2014. Lumix LX-7 ISO 80, f3.5 1/500th second. Please spread the word and share Tracking the Light with anyone who may enjoy seeing it! The Sun Doesn’t Always Shine In Dublin; But it did on April 2, 2013! Irish Rail: Action on the Quad Track at Clondalkin. Irish Rail’s only four track mainline transits the west Dublin suburbs. This was built toward the tail-end of the Celtic Tiger boom years. Rail traffic flows in fits and starts, but midday on week days can result in some interesting action. Irish Rail 229 leads IWT liner. The prize this day was catching Irish Rail’s General Motors-built 071 class locomotive 079 hauling the elusive per-way ‘Rail trucks’ (rail train) on its run from Platin (on the Navan Branch) to the per-way depot in Portlaoise. I worked with my Canon EOS 7D, which handles the cloudy bright lighting conditions admirably. Tomorrow: November Light along the Juniata River. Irish Rail’s track geometry car followed today’s Dublin to Ballina IWT Liner. This unusual piece of maintenance equipment is among the more elusive subjects on the Irish network. I was surprised to see it when I peered over the wall on the St John’s Road this morning. Irish_Rail 218 leads Friday’s IWT liner with EM50 on Platform 10. Exposed with a Canon EOS 7D with 40mm Pancake Lens. Exposed using a Canon EOS 7D with 40mm Pancake lens. Friday September 12, 2014. Tracking the Light posts new material everyday! Sunlight and a Clean Locomotive. As a follow up to yesterday’s special post, I’ve included a few more photos. Since Monday, Irish Rail’s freshly painted class 201 number 215 has been working the IWT Liner between Dublin and Ballina, Country Mayo. Wednesday’s (September 10, 2014) IWT Liner passes Islandbridge Junction near Heuston Station, Dublin. Thin cloud diffused the sun. Lumix LX7 photo. Today’s (September 11, 2014) Ballina to Dublin IWT near Clodalkin-Fonthill Station. Lumix LX7 photo. Tracking the Light posts new material Daily. Sometimes when your mind is pre-occupied with the problems of the world, the best medicine is go trackside and focus on something trivial (like hoping for sun light on a freshly painted locomotive). Yesterday (September 9, 2014), I was poised for photography at an over-bridge near Lucan South in the Dublin suburbs. Colm O’Callaghan, Noel Enright, John Cleary and I were anxiously waiting for Irish Rail’s Up-IWT liner led by class 201 diesel number 215 (which had made its first trip in fresh paint the day before and was on its return run). Although it was a dry bright day, a group of fair weather clouds were loitering in the sky between us and the sun . At one point all four of us were staring skyward hoping the cloud would move. Irish Rail’s Mark4 from Cork on September 9, 2014. Canon EOS 7D with f2.0 100mm lens. 1/1000th of second at f3.5 ISO 200. Canon EOS 7D with f2.0 100mm lens. 1/1000th of second at f5.6 ISO 200. The Cork-Dublin passenger passed in cloudy light; but the Inter City Railcar behind it was blessed with sun. But then clouds returned. I fussed with my light meter. As the freight approached, the clouds parted and the sun-light seemed to roll across the landscape. I fired off a burst of digital images using my Canon EOS 7D, followed by a couple of Fujichrome Provia 100F colour slides with my EOS 3 with 40mm pancake lens. Fresh out of the paint shop: Irish Rail 215 leads the Ballina to Dublin IWT liner. This is the first 201 class diesel on the road to wear the new Irish Rail logo (on the side of the engine). Canon EOS 7D with f2.0 100mm lens. 1/1000th of second at f5.6 ISO 200. If there was one problem with the last burst of sunlight it was that I may have overexposed my slides by 1/3 of stop. But I won’t know until I have the film processed in a few weeks time. Views from Dublin, July 2014. I was waiting with Ciarán Cooney for the up-IWT liner when I made this photo of the Cork-Dublin Mark4 push-pull in the Gullet on approach to Heuston Station. Lumix LX7 photo. The Mark4 set was blocked at the signals in the Gullet, while an outbound Inter City Rail departed Heuston Station. Irish Rail class 201 diesel numbe 224 worked the back of the Mark4. Locomotives typically face Cork on the Mark4. Lumix LX7 photo. Not long after the Mark4 had passed, the IWT Liner with locomotive 206 came into view. While not unheard of, it’s a bit unusual to find an Enterprise painted class 201 working freight in 2014. Stranger things have happened, but I was happy enough to catch this in the sun. Lumix LX7 photo. Most weekdays, Irish Rail’s IWT Liner works between Dublin’s North Wall and Ballina carrying intermodal freight. Class 201 General Motors diesels are most common, although Class 071 diesels work it occasionally. In the last week of July, locomotive 206 dressed in the Enterprise livery for work on the Dublin-Belfast express passenger service, made several trips on the IWT Liner. This offered a refreshing visual change, from the relatively monotonous parade of trains out of Dublin on the Cork line. On several occasions, I intercepted 206 in its freight duties. Making exposures with my Canon EOS 7D and Lumix LX7. Another day, another liner. Locomotive 206 works around from the North Wall with the IWT liner heading for Ballina, County Mayo. Lumix LX7 photo. Irish Rail 088 leads the HOBS near Islandbridge in Dublin on July 30, 2014. Exposed with a Canon EOS 7D with 100mm lens. Word came over the ‘telegraph’ that an Irish Rail HOBS (high output ballast system) train was on its way over to Islandbridge Junction to run around. I’ve photographed the HOBS on previous occasions, but its one of the more unusual trains to catch on the move. This time, I thought I’d try a slightly different perspective from my standard location. Using my Canon EOS 7D with 100mm lens, I framed the line up in a tight vertical view prominently featuring the Wellington Testimonial. This massive obelisk rises high above the Phoenix Park. It is claimed to be Europe’s largest, and it can be seen from all around Dublin. I made several views . Unfortunately, while there was a big patch of blue sky behind me, the sun wasn’t fully out when the train arrived. So I had to do my best to work with what I had. It didn’t take long for locomotive 088 to run around. Yet, I walked quickly, and I made and series of images of the train heading back into the Phoenix Park Tunnel. Lumix LX7 view of the HOBS about pass into the Phoenix Park Tunnel on its way over to the North Wall. I modified the RAW file in Graphic Converter and Photoshop to improve the contrast using both global and localized adjustments. The great thing about this exercise was the minimum time I had to wait around. Thanks to good contacts and prompt running (on the part of the HOBS) I scored several relatively unusual photos in just a few minutes! Tracking the Light Extra! Breaking Views! A Long Delay Results in an Unexpected Opportunity. We waited at milepost 17 near Sallins for the return of locomotive 461 with Railway Preservation Society Ireland’s The Marble City rail tour from Kilkenny. After a bit of a delay, I’d became curious and tried phoning people on the train. After a few phone calls I learned that tragedy had delayed the excursion. It was reported that Irish Rail’s regular Intercity train from Waterford was involved in a fatality on the line and the steam special was stranded at Athy while the Gardai (An Garda Síochána is the Irish name for Ireland’s national police force) conducted an investigation. I was told by an RPSI member on the train that it would be at least 8pm before the train was on the move. Lumix LX7 view of the line looking toward Dublin. Instead of giving up and returning to Dublin, fellow photographer Hugh Dempsey and I opted to remain trackside. After all, only the Waterford trains were affected, so there would be plenty moving to photograph. And there’s the element of curiosity, just how late would the train be? I took the opportunity to update some local people who had turned out to watch the steam special of its misfortune. Later, a local man took pity on our prolonged wait, and dropped down to us with cups of hot tea and biscuits (cookies). In the mean time there was some nice evening light to photograph the ordinary procession of Irish Rail trains. The Cork-Dublin Mark4 works toward Dublin with a 201-class diesel locomotive at the back. This meets an ICR working downroad. Canon EOS 7D photo. Experimenting with the pan technique I exposed this view of a downroad ICR at milepose 17. With the same types of trains running every few minutes in the evening, I had lots of opportunity to try different angles. Lumix LX7 view. A blast of evening sun illuminates an old CIE 20 foot container along the line. Canon EOS 7D with 200mm lens. An uproad ICR at milepost 17. Canon EOS 7D with 200mm lens. An uproad ICR catches a wink of evening sun. Canon EOS 7D with 200mm lens. Finally, at 9:18pm I got word that The Marble City with 461 had reached Cherryville Junction and was making its dash for Dublin—some four hours behind schedule. The light was fading fast when I made this view of an uproad Irish Rail ICR at milepost 17. What could expect of the steam special? It passed us just before 10pm, which made for a rare summer evening view of an Irish steam special. Most RPSI trips run in daylight! Using film I’d have been out of luck, but thanks to advances in digital photograph I was able to make a distinctive image. Exposed at 9:51pm on July 27, 2014 with a Canon EOS 7D with f2.0 100mm lens, set at ISO 3200 1/80th of a second at f2.0. White balance set for ‘daylight.’ To keep the locomotive sharp, I panned slightly. I processed the camera RAW file in Photoshop to lighten the image slightly and improve contrast. Sun, Clouds, Rain, Railcars and . . . Yes all true, but I’d traveled down to catch the return leg of steam hauled The Marble City rail tour operated by the Railway Preservation Society Ireland. I departed Dublin Heuston on the 1430 suburban train heading for Sallins. I was fortunate to travel on a five-piece intercity rail car (ICR), which was comfortable and mostly empty. Interior of my train at Heuston Station Dublin. Lumix LX7 photo. Irish Rail’s Rotem-built Intercity Rail Cars are comfortable trains. Lumix LX7. Arriving Sallins, County Kildare at 2:55pm, I had time for a leisurely bacon and cabbage lunch at the Lock 13 Pub—located along the Grand Canal a short walk from the station. I’d arranged to meet fellow photographer Hugh Dempsey after 4pm to explore some track side locations nearly in anticipation of photographing locomotive 461 with The Marble City. The Lock 13 Pub at Sallins, County Kildare. Lumix LX7 photo. Sallins station with a foreboding sky. An ill wind was blowing; beware beware! LX7 photo. The 1600 Dublin-Cork ICR approaches Sallins at speed. An automatic voice warns, ‘please stand back, train now approaching.’ Canon EOS 7D with 200mm lens. A few minutes later another ICR passes, this time in the Dublin-bound direction. Canon EOS 7D with 200mm lens. The special was scheduled to depart Athy at 2:55 pm and according to Irish Rail company literature would depart Kildare at precisely 5:23 pm and 30 seconds. Armed with this information we scouted a bridge near milepost 17 and waited. Shortly after we arrived at milepost 17 the sky opened. It was like standing in Niagara Falls. Canon EOS 7D with 200mm lens. An uproad ICR races toward Dublin in the rain. Canon EOS 7D with 200mm lens. The usual procession of up and down passenger trains passed, mostly using the common Irish Rail Rotem-built ICRs—like the one I’d traveled down on. The weather changed from sunny to pouring rain rather suddenly; uncomfortable, but not unusual. We’d expected The Marble City to pass by about 5:50pm. More ICRs up and down, but no sign of the steam. By 6:30pm we were wondering what had gone wrong. After another hour we learned that there had been a fatality on the line south of Cherryville Junction (where the line to Kilkenny and Waterford diverges from the mainline to Cork) and 461 with The Marble City was being held at Athy! Oh no. That didn’t bode well at all! Stay tuned for more. . . . ! The down Dublin to Cork Mark4 approaches milepost 17. Dublin’s Heuston Station, April 9, 2013. 1976 – The “Sallins Train Robbery”. It was a glorious bright Spring day in April 2003. For years, a single Irish Rail class 121 had worked a short push-pull Mark 3 set on the Limerick-Limerick Junction shuttle. But when I made this photograph the set was on borrowed time. Irish Rail’s Limerick Junction shuttle near Dromkeen, County Limerick on April 19, 2003. Exposed on Fujichrome Sensia 100 with a Nikon F3 with 85mm lens. Earlier in 2003, Irish Rail had suddenly withdrawn most of the 121 class, and most were quickly reduced to scrap. Only two remained in service and it was rumored they might soon go the way of the others. As it turned out, the 121 with Mark 3 set didn’t last much longer Limerick Junction shuttle and this was among my last photos of in that service. However, the locomotives struggled on much longer than I anticipated. I last photographed them in permanent way service in Dublin in early 2008, nearly five years later. Not that I’m complaining. Earlier that day, I’d made this view of the same Limerick Junction shuttle at Oola. This was previously published on tracking the light. Photo was also exposed on Fujichrome Sensia 100 with a Nikon F3 with 85mm lens. Remembering Irish Rail’s Athy Cement. A few weeks ago, Ciarán Cooney asked me about photos I’d made of Irish Rail’s Athy Cement. This used to run weekdays from the cement factory near Limerick to a cement silo off a short branch that crossed the River Barrow in Athy, County Kildare. It was the only train to use this branch. On several occasions, I’d made the effort to photograph this train, which tended to arrive laden in the very early morning, then depart empty after it had discharged. Most of the times I saw it, it ran with a single Bo-Bo General Motors diesel (class 141 or 181). I caught it crossing the Barrow at Athy on a fine spring morning, May 3, 2002. Exposed with a Nikon F3 with 85mm lens on Fujichrome Sensia 100 slide film. That was more than 11 years ago, but it doesn’t seem so long.I think I last photographed this train about 2005, shortly before it was discontinued. While cement trains worked Irish Rail for a few more years, they are now extinct. Please share Tracking the Light with everyone who may enjoy it! Ammonia Train in May 2001. Back then, Irish Rail operated three daily ammonia trains between Marino Point, County Cork and Shelton Abbey near Arklow, County Wicklow. These were tightly scheduled and normally operated with the common 201-class General Motors diesels. I was tuned into these trains, and made an effort to catch them in interesting locations. The traffic ended with little warning in 2002, so the photos I made are now prized images! In addition to color slides, I exposed thousands of black & white images of Irish railways on 120 size film between 1999 and 2005 (and a few here and there since). Most of these photos have never seen the light of day. This rare photo of the Ammonia train was just one of several exposures I made on that bright May afternoon in 2001. Why didn’t I make a color photo? And who said I didn’t? Must color and black & white be mutual exclusive? Why not make a color photo and convert it later? Why color anyway? I’ve often worked with multiple formats at the same time. Black & white has a number of advantages and I’ve long prided myself on mastering this archaic image-making process. Irish Rail—May Bank Holiday Monday. Here’s a dozen images: On Monday May 5, 2014, I traveled to Kildare, and spent the day making photos of Irish Rail’s operations. Irish Rail 22000-series ICR heading down road at Kildare on May 5, 2014. Exposed with a Canon EOS 7D with 20mm lens. 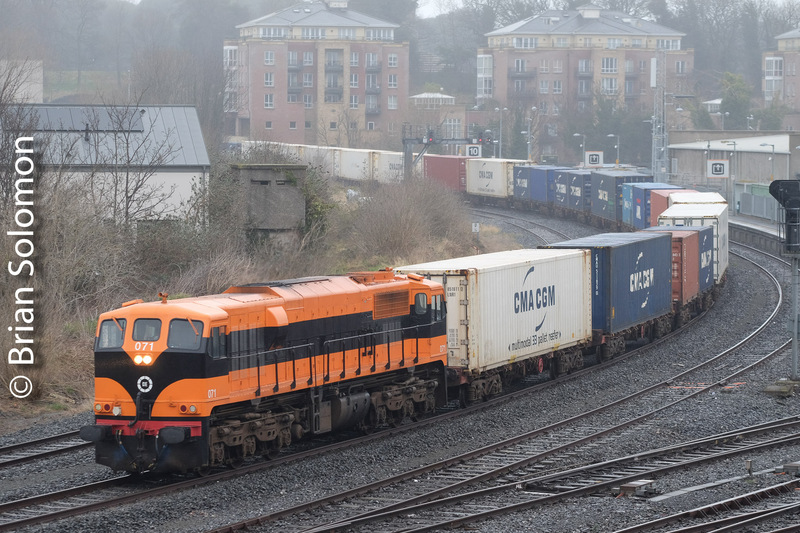 The goal was to photograph the Up and Down IWT (International Warehousing and Transport) Liners (running to and from Dublin from Ballina), with a hope that the elusive timber trains might operate. Irish Rail’s timber is elusive enough, so far as I’m concerned. It only operates two or three days a week, and often seems to get canceled when I’m out for it. The weather was mixed; a bit of rain in the morning, a few bursts of sun in the afternoon. In other words, a typical May day in Ireland, if a bit on the cold side. The foliage was lush and green. The down IWT liner (Dublin-Ballina) ran later than I anticipated, while the up IWT was more or less as expected. Timber trains made their appearance as hoped. Since the timber must run around at Kildare station to change direction (it runs from Waterford to county Mayo, and there’s no direct chord at Cherryville Junction to facilitate a move for trains moving from the Waterford Line to the West), this allows opportunity to catch the timber train twice. Irish Rail’s Rotem Intercity Rail Cars are the standard equipment on most intercity passenger services. Trains passing Kildare serve Cork, Limerick, Waterford, Galway, and Mayo lines. Exposed with a Canon EOS 7D with 40mm lens. Irish Rail 220 leads Monday’s Dublin-Ballina IWT liner seen west of Kildare, near Cherryville Junction. Exposed with a Canon EOS 7D with 100mm lens. trailing view of the Dublin-Ballina IWT liner as it approaches the signals for Cherryville Junction. Exposed with a Canon EOS 7D with 100mm lens. Not long after the down IWT the up IWT came into view. An ICR has just passed down road and is approaching Cherryville Junction. Exposed with a Canon EOS 7D with 100mm lens. An ICR catches a burst of sun as it nears Kildare station. Exposed with a Canon EOS 7D with 20mm lens. Hark! Is that the drone of an 071? Yes, it is. Irish Rail 075 is a battle-worn veteran with many years of hard service. It leads an empty timber train from Waterford. This will run around at Kildare and head down road toward Mayo for reloading. Exposed with a Canon EOS 7D with 20mm lens. The Dublin-Cork Mark 4 hurtles down road at Hybla Bridge near Monasterevin. The empty timber wasn’t far behind. Exposed with a Canon EOS 7D with 40mm lens. Patience prevailed: Irish Rail 072 wails away with the laden timber heading toward Kildare to run around. Exposed with a Canon EOS 7D with 40mm lens. Trailing view of the laden timber at Hybla Bridge. The need for the timber train to run around leaves ample time to reposition on the Waterford Line south of Cherryville Junction. As the crow flies, this location is only about 4 miles from Hybla Bridge. Last shot of the day: Irish Rail 072 leads the laden timber at Oghill, milepost 36. Exposed with a Canon EOS 7D with 20mm lens. All in all, it was a productive day photographically. Since most of Irish Rail’s passenger services are now provided by common 22000 series Rotem-built InterCity Railcars (ICRs), I’ve only included at few of the many passenger trains that passed that day. Islandbridge, Dublin April 29, 2014. Among the difficulties of living within sight of the railway is the chance that such proximity may breed photographic apathy and slough. One the plus side, when something rumbles by, all I have to do is look out the window! There are several nice photo locations within a ten minute walk of Islandbridge. On the downside, over the last decade I’ve covered these nearly to the point of exhaustion. Yet, that doesn’t keep me from taking advantage of them. Shortly before 11am on Tuesday April 29, 2014, I heard the distinct roar of an Irish Rail 071 class diesel (built by General Motors Electro-Motive Division). I glanced out the window to see a gray locomotive roll into the Phoenix Park tunnel with a wagon transfer for Dublin’s North Wall. Ah! A grey locomotive and the elusive wagon transfer! I made a call to alert a friend, and a short while later I got a call back to say that the wagon transfer had collected three flats and was on its way back. The locomotive was 085 which wears a variation of the gray and yellow livery introduced a year ago. Irish Rail 085 with three flat wagons approaches Islandbridge Junction on April 29, 2014. Canon EOS 7D with 100mm lens. I opted for vertical composition to feature the monumental Wellington Testimonial that sits in Dublin’s Phoenix Park. (Exposed at f9 1/500th of a second ISO 200). It was a rare clear sunny morning, and I was keen to make a color slide of this engine passing Islandbridge Junction. Armed with good information, I walked five minutes up the road to my often-used location and waited. Less than 15 minutes passed before 085 appeared from the tunnel with the three flats. A closer horizontal view with the same camera-lens combination. I adjusted the exposure by a one-third stop, opening to f8.0 to compensate for the lack of sky in the image. Locomotive 085 features a variation of the gray and yellow paint scheme introduced last year. This features the traditional three-digit locomotive number in larger fonts on the cab. This in addition to the recently introduced European multiple number printed in tiny type elsewhere on the engine. I exposed a few digital images with my Canon EOS 7D and 100mm lens, before executing a color slide (or two) with my EOS 3 with 40mm lens. I was home less than 30 minutes after leaving. Back to the book writing! I’m presently researching a book on North American signaling. Tomorrow: View from a Castle. Railway Preservation Society Ireland’s Easter Eggspress. To Wicklow and Return, April 21, 2014. Railway Preservation Society Ireland celebrates 50 years this year. Canon EOS 7D with 100mm lens. A clear bright day and an excellent crowd made for a great day out with locomotive 461 and the preserved Cravens carriages. The train boarded at Dublin’s Connolly Station and ran directly to Wicklow with stunning views of Dublin bay from Killiney and Bray Head. Irish Rail 227 with the Belfast-Dublin Enterprise rests alongside locomotive 071 (now 0117071) that was about to shunt the RPSI train from platform 3 at Connolly. 461 was steamed up and ready to couple to the train and take it into platform 5 for boarding. Canon EOS 7D with 100mm lens. Steam on a sunny morning. Locomotive 461 pulls into platform 5 at Connolly Station. Canon EOS 7D with 20mm lens. Departing Dublin offered views from the Loop Line bridge of the Customs House and River Liffey. Canon EOS 7D with 20mm lens. Passengers and RPSI staff at Wicklow. Canon EOS 7D with 100mm lens. Unloading prams from the van. Canon EOS 7D with 100mm lens. 461 runs around at Wicklow for the short turn up to Greystones. Canon EOS 7D with 100mm lens. 461 couples up at Wicklow. I miss the old mechanical semaphores with lattice masts that once protected Wicklow station. Canon EOS 7D with 20mm lens. At Wicklow, the special was overtaken by a holiday ‘relief’ special to Gorey that operated with the freshly painted candy apple green 29000 set. A short trip was run from Wicklow to Greystones and return, with some spirited running along the beaches south of Greystones. Ah! The elusive freshly painted 29117! Engine 461 is a former Dublin & South Eastern 2-6-0 goods engine, so it was working on old home rails. The locomotive was steaming well and made for a great performance. Reported difficulties with the points at Wicklow resulted in minor delays on the return trip, but clear signals up to Dublin and excellent running by the steam crew found us back at Connolly only a few minutes behind the advertised. I traveled on the train, and used opportunities at station stops to make photos of the crew. These are some of my digital results. I also used my old Nikon F3 with a 24mm lens to exposed some Fuji Acros 100 black & white film. Somehow steam and B&W seems like an appropriate combination! Those images remain latent, and perhaps will be a topic for a future post! The bushes match 461’s buffer beam. Dublin-Rosslare ICR approaches Wicklow. Canon EOS 7D with 100mm lens. Steam crew in the cab of 461. Canon EOS 7D with 100mm lens. 461 shunts the train at Wicklow. Canon EOS 7D with 100mm lens. Shoveling coal is a dirty job, but someone has to do it! Canon EOS 7D with 100mm lens. RPSI Cravens under the shed at Connolly Station. Tomorrow: The DART in Pictures. Connolly Station, Dublin, April 21, 2014. Irish Rail 0129117 in the new livery at Connolly Station on April 21, 2014. Canon EOS 7D with 20mm lens. Several weeks ago, Irish Rail released one of its 29000-series suburban railcars in a fresh new two-tone green and yellow livery. My initial haphazard attempts at finding this train on the move were unsuccessful. However, on April 21, 2014, I got lucky. I was riding Railway Preservation Society of Ireland’s Easter Eggspress led by steam locomotive 461, when at Wicklow, our train was overtaken by an Easter Monday ‘relief’ from Connolly to Gorey worked by set 0129117 (formerly 29117) in the new livery! Armed with this knowledge, I consulted my operations expert for advice on when the train would return to Dublin. After the Easter Eggspress arrived back in Dublin, I made my way over to Platform 6. Here I scored these views of the freshly painted train that arrived about 15 minutes later. Soft early evening sun made for nearly perfect lighting conditions. After the train discharged its passengers, it worked back over the Loop Line toward Pearse Station and the old Boston sidings. I always like to catch a new livery as soon as I can; Before it gets dirty, before someone decides to change it. Tomorrow: Railway Preservation Society of Ireland’s Easter Eggspress! Traveling to M3 Parkway on an ICR. A few years ago Irish Rail rebuilt a portion of its old line between Clonsilla and Navan. This had been closed in the early 1960s and the right of way had largely returned to nature. In late 2009, I’d explored the rebuilding as tracks were being installed, but I’d been negligent in my photography of this new route since that time. On Wednesday, April 16, 2014, I rode the LUAS tram to Dublin’s Docklands and walked over to Irish Rail’s Dockland station at the North Wall. This was built during the Celtic Tiger boom, which had also resulted in abandonment of most of Irish Rail’s North Wall freight yards. An Irish Rail four-piece InterCity Railcar arrives at Dublin’s Docklands station on the afternoon of April 16, 2014. Lumix LX3 photo. Irish Rail at Docklands Station, North Wall, Dublin. April 16, 2014. This area was once sprawling freight yards. Lumix LX3. I went for a relaxing spin directly to the end of the new branch at ‘M3 Parkway’. The track was in superb condition. On my return trip, I changed trains at Clonsilla. Instead of returning via Docklands, I rode directly to Connolly Station. Later, I learned that two hours before my trip the elusive Sperry train had made a run to M3 Parkway and back! I had no idea. Right place, wrong time. Lucky miss, I guess. Irish Rail’s InterCity Railcar at M3 Parkway station. Lumix LX3 photo. A 29000 series railcar works toward M3 Parkway at Clonsilla. Canon EOS 7D photo. On the left is a 29000 series railcar destined for M3 Parkway, in the distance a train from Maynooth to Connolly Station can be seen at the new Junction where the route to M3 Parkway diverges to the right. Canon EOS 7D with 100mm lens. Tomorrow: Irish Rail’s new Suburban Livery! DeForest Station, June 14, 2013. Irish Rail, Heuston Station, Dublin. A railcar sunset? No, it’s not a metaphor, it really was a railcar at that time of day. Using my Lumix LX3, I made this panned view. It captures the motion while helping to visually separate the front of the train from the interior ironwork. The low light allows for a pleasing glint effect without becoming overbearing or distracting. Lumix LX3 photo; f2.2 1/50th ISO 80. Contrast and exposure adjusted in post processing. Tomorrow: narrow alleys and narrow gauge. Irish Rail 22000-series Intercity Railcars make a daily transfer at Islandbridge Junction on the morning of April 18, 2014. It was here that I photographed Irish Rail’s elusive Sperry Train back on August 30, 2012. Good Friday has a long-standing tradition of being a special day on Irish Rail. The weather is usually fine, and there’s always something interesting on the move. This year Good Friday again met, and exceeded, expectations. The previous day had been a disappointment. On Thursday, April 17, 2014, my friend Colm O’Callaghan and I had been out for the Irish Rail Sperry train. (Previously in Tracking the Light, I’ve highlighted this elusive rail-defect detection train, see: Sperry Train at Islandbridge Junction on August 30, 2012). On that day, we waited in vain under increasingly cloudy skies. As it turned out the Sperry’s plan for the day was cancelled. When Good Friday dawned clear and bright, I wondered if there was anything on the move. I’d set out for the shops to get some breakfast, but had the wisdom to bring some of my cameras with me. On the way, I stopped at my familiar Islandbridge Junction overlook (near Heuston Station), where I noted that a railcar transfer was in progress. I made some photographs. Then, I heard from Colm: the Sperry train was expected to depart Dublin’s North Wall after 10am! Wheels were turning! My morning shopping trip was suspended as we headed ‘down road’ to find places to intercept one of Ireland’s most difficult quarries. This Sperry rail-defect detection train only makes a few trips a year, and it had changed its program on a moment’s notice! Irish Rail class 071 General Motors diesel locomotive number 081 leads the Sperry consist near Straffan on the Dublin-Cork mainline. Exposed with my Canon EOS 7D and 20mm lens. Trailing view at Straffan. Canon EOS 7D with 20mm lens. The Sperry train had gone to Sallins to run around, and in this view (near Hazelhatch) it was returning up-road toward Heuston Station. Canon EOS 7D with 100mm lens. Lumix LX3 photo at milepost 11 3/4 near Hazelhatch. Sperry’s detection equipment is in the yellow container riding on a flat wagon. Immediately behind the locomotive is the weed spraying van, where the Sperry crew can ride to monitor equipment. The yellow tank wagons at the back of consist are also normally used for the weed-spraying train and are included with the Sperry consist to assist with braking. Our quick action and careful thought paid off. As it turned out, the Sperry was working up and down on the quad track section of the Cork line. So, we had several excellent opportunities for photography. Assisting our efforts were regular updates and communications from like-minded photographers up and down the line from our positions. (Thanks guys!). For me the day’s highlight followed a tense moment at Stacumny Bridge (near Hazelhatch), when the up-road IWT Liner (Ballina to Dublin container train) and the Sperry train (working down road) approached us simultaneously! This had all the ingredients for a photographic disaster. While waiting for the 3rd pass of the Sperry train we caught the daily down IWT Liner (Dublin-Ballina containers). This is a favoured location at Stacumny Bridge near Hazelhatch. Canon EOS 7D with 100mm lens. Anticipation! When both the Dublin bound IWT liner and Sperry train appeared simultaneously, I changed my plan. Both trains are moving! Lumix LX3 photo. Irish Rail 081, leads the Sperry train down road. It was making multiple trips to scan different tracks on the quad track section between Cherry Orchard and Hazelhatch. Sperry’s train examines rails for internal defects. Lumix LX3 photo. Sperry rail-defect detection equipment is housed in this specially outfitted container that rides on a flat wagon. This is the important part of the train. Note Sperry’s logo on the back of the container. Canon EOS 7D photo. Trying to position for two moving trains in opposite directions takes skill and a lot of luck. We were very lucky. In the end, while I didn’t get what I’d anticipated, instead, made a once in a lifetime photograph: the near perfect rolling meet between the liner and Sperry train under full sun! Yea! Trailing view of the up IWT liner at Stacumny Bridge, April 18, 2014. Lumix LX3 photo. The downside: by the end of the day my poor old Panasonic Lumix LX3 developed a minor intermittent electrical fault. While, I was still able to make photographs with it, its reliable performance is now in question. After near five years of hard service, my favorite ‘everywhere camera’ may need to be replaced! In the meantime, I’ve got my Canon EOS 7D, plus Canon film cameras and my old Nikons to fall back on.